The Monaco Grand Prix was certainly close: that the top six cars finished but 6.1 seconds apart showed this. But as far as many fans are concerned it was not exciting. Well, I don't know if this will be much comfort to those who hold such opinions but 'twas ever thus at Monaco. Or at least, it has been the way of it since the swimming pool complex was introduced to the track in 1973, thus condemning most subsequent races to be a case of follow-my-leader. Indeed, if you want a graphic example of this you only have to look back to a Monaco Grand Prix that has gone into folklore. In 1992 Nigel Mansell, having made a pitstop and being on fresh tyres, was likely several seconds a lap quicker that Ayrton Senna's leading McLaren, but despite many laps dodging and weaving he couldn't find a way past, nor even a credible opportunity at having a stab. 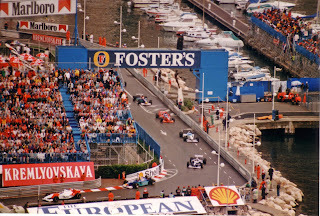 The Monaco races in 1979, 2002 and 2006, to name but three examples, were won in similar style to Mark Webber last Sunday, namely taking the lead at the start and controlling things from there, even as apparently faster cars built up behind. And according to the stats this year we weren't too badly off in terms of passing. From Clip the Apex's overtaking analysis, there were 12 overtakes in total in this year's Monaco race, which is pretty bang on the average for a Monaco race since 1981 (and above average for a dry race). And we should consider ourselves lucky: in the 2003 race there was a big fat zero overtaking moves, while in 1998 there was a grand total of one, and in 2000, two. And is anyone arguing that, in those late laps at Monaco this year, when the front six were running literally nose to tail and the rain was beginning to fall, that they didn't have their hearts completely in their mouths? If they didn't, then I just feel sorry for them. 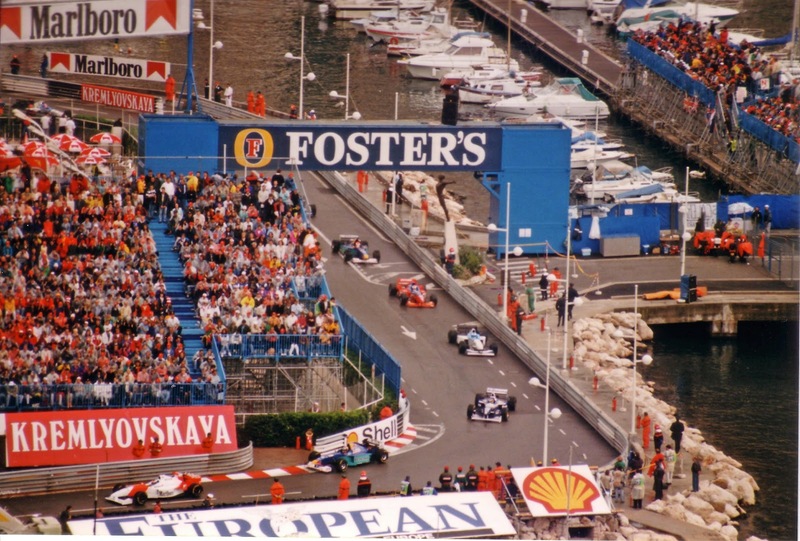 Further, in Monaco this year the extent that the front runners 'stretched out their strategies', and therefore the duration of their stints on a single set of tyres, was in large part dictated by peculiar circumstance. Many expected rain at around the time of the first pit 'window', and therefore no one wanted to stop for their second set of slicks only to have to then pit again for intermediates almost immediately, and thus consign themselves to a frustrating afternoon in the midfield. And by the time they did pit a one-stopper was feasible (with careful handling of their rubber). Indeed it became necessary, as had they pitted for a second time Sebastian Vettel, helped by his contrary strategy, would have leapfrogged them. I suspect that without the rain threat the leaders at least would have undertaken a more orthodox two-stopper. And Paul Hembery must be tearing his hair out. Having endured criticism all season for not producing tyre with a longer lifespan, when most of the field are able to complete a one-stop race using the softs and supersofts people still complain! With the relative scarcity of overtaking in the Monaco race, pit strategy was the place to look for order changes. Here, the two 'high climbers' among the front runners were Fernando Alonso, who moved from fourth in the first lap running order to third by the end, and Sebastian Vettel, who made the journey from sixth to fourth. Might Fernando Alonso have finished even higher in Monaco? For both, however, things just might have been even better. The Monaco race was almost a throwback to the days of refuelling, wherein both climbers made their hay by staying out longer then those around them. 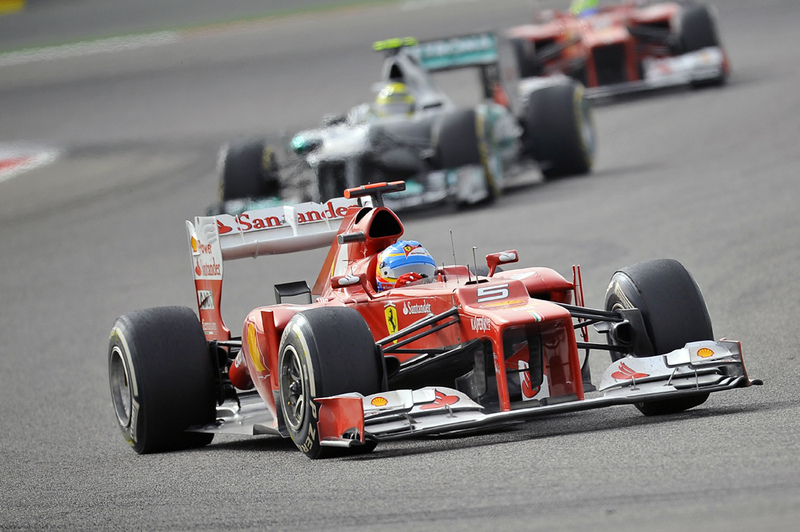 In Fernando's case, one lap was all he needed to get ahead of Lewis Hamilton and into third place. Staying out an extra lap over his rival he made the timing screens glow purple, and his prodigious time combined with the equally rapid Ferrari pit crew (who've been the quickest with their wheel guns all season) won him the place. Indeed, his in-lap including the stop clocked at 1:36.242, compare this to the equivalent 1:39.6 for Hamilton, as well as the 1:38.4 for Webber and the 1:37.1 for Rosberg. But, could Alonso have gained further places had he stayed out even longer? The speed of his in-lap may indicate there was still a bit of life in his supersofts, while Webber was subsequently to have a bit of bother getting his new soft tyres up to working temperature. It's possible of course, but knowing that would have required the 20:20 vision of hindsight (and Rosberg's first lap on his new tyres, pretty much all the Ferrari pitwall had to go on at the time, was pretty quick). Plus Ferrari and Alonso are aiming for consistency this year, and rolling the dice could just as easily have landed them in sixth rather than first. For a tantalising spell midway through the Monaco race, the win looked like it might just be Vettel's for the taking. After going against the grain by starting (in ninth place) on soft tyres he was catapulted into the lead after everyone else had pitted, and the gap to Webber behind for a time was stretched by over a second per lap, to about 16 seconds. With 21 seconds in hand Seb indeed could have pitted and still been in the lead, but the 16 second gap was as good as it got for him as his tyre, finally, started to fall away from him as well as that Webber and co returned to a more normal pace. Some, including the Mercedes pitwall, speculated that Webber might, or indeed did, seek to go on a 'go slow' and back the pack up behind him, thus letting Vettel gain more positions. All concerned deny this, saying Webber's slower pace post his stop was simply about not getting his tyres up to optimum temperature for a time. It's interesting though that the team didn't enact such an approach (or apparently even consider it). Jean Todt's Ferrari machine for one wouldn't have thought twice about doing it. While I take an agnostic view on team orders, the fact that such moves are a lesser part of the F1 canvas than used to be the case is an area in which the sport has definitely improved for us watching on. F1 reflects the world around it in many ways. One unfortunate area in which this manifests itself is the belief that one is 'only as good as their last game'. The folly of such an outlook was on full display in Monaco. This was especially so on Saturday, when Michael Schumacher 'stunned' everyone by setting the quickest qualifying time, having ended his race early in the previous round in Spain by driving into the back of Bruno Senna and been roundly written off in response to it. 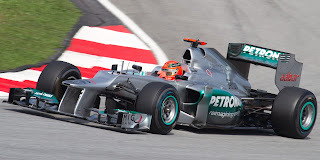 But, that incident apart, Schumacher has driven well this year, and his relative lack of points can be attributed more to ill-fortune than to being off the pace. The Senna clash in Spain is much more the outlier in Schumi's performances than is the Monaco qualifying lap. And it's not just applicable to Schumi: nonsense was written about Vettel after he tagged Narain Karthikeyan in the Malaysia race, to the effect that he was being 'found out' this year due to not having a dominant car. Well, again that incident aside, Seb has driven and raced extremely well in 2012, and despite not having access to a 'dominant car' is but three points off the drivers' table top. It has been the same story with Felipe Massa: many barely noticing his strong runs in China, Bahrain and Monaco but having him heading swiftly for the Ferrari scrap heap after less good runs such as in Spain. Perhaps it reflects that, in the media and elsewhere, people are attracted to stories that declare seismic shifts - 'such and such is finished' etc - as they are exciting and attention-grabbing. However, the more mundane explanations may be the more accurate ones. Seismic shifts don't happen that often, F1 drivers don't forget how to drive overnight, particularly not multiple world champions. Just remember, as any scientist will tell you, if it's interesting it's probably wrong. And without wishing to fall into the same trap as outlined in the previous section, another burgeoning story from Monaco was Jenson Button's struggles in recent times. Jenson Button: starting to struggle? His win in the season opener in Australia seems a very long time ago now, wherein he followed up on an excellent 2011 and thus became many people's early championship favourite. But since then all he has to show for his efforts is a second place in China and a rather distant ninth place finish in Spain. In the last two rounds he's not even made the final stage of qualifying, and for the most part of these events he's cut a rather pained, frustrated figure. Why is this? 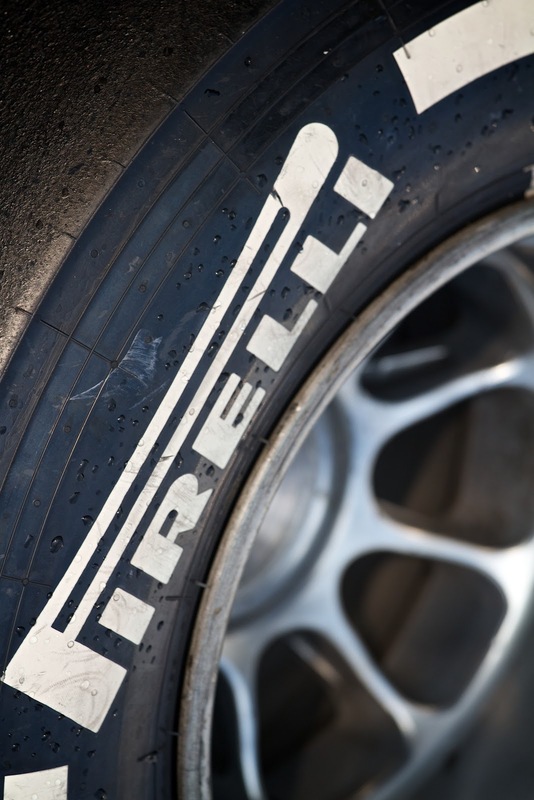 Perhaps the adaptability and improvisation required from the latest batch of Pirelli tyres doesn't suit Button? For all of his virtues as a driver his operating window has always seemed narrower than that of Hamilton, Alonso and the like, and his ability to 'drive whatever is underneath him' less developed. Another factor may be that the effective outlawing of the aggressive exhaust blowing of diffusers, which tended to give a planted rear end of the car which Jenson usually craves, might have taken him away from his comfort zone? Furthermore, as mentioned the leader on the opening lap has won four times from six this year (and in five dry races the winner has come from the top two in all five), and we've seen how this year's tyres can fall away quickly when running in turbulent air behind another car, so perhaps Jenson not being a qualifying specialist (hardly a secret, he's only won seven pole positions in his career and his last was almost exactly three years ago) is playing against him? But let's not forget as well that Lewis Hamilton bouncing back from his diffcult 2011 will have also played at least some part in things. For the reasons I've given it's way too soon to write Jenson off, and in Monaco he can claim a bit of a hard luck story after losing several places in the first corner melee which, being Monaco, left him stuck for the duration. But as the fraternity goes to Canada, the scene of possibly his greatest triumph 12 months ago, plenty of eyes will be on Jenson. You know...I am a closet F1 fan. What I mean by closet is that I have only one other person that I really get to speak to regarding the sport; the product of middle age, self-employed father of 4. I stumbled upon this blog and must say it was refreshing to have no argument with you Graham! Monoco is historically follow the leader. Most television commentators tell you so starting with Thursday practice coverage. The most passing we see is in the pits and from mistakes. As far as the tyre arguments ... really? We haven’t seen this kind of action in a long time; and I give it to the tires....thumbs UP! Part of being a team is to strategize tire wear through car setup to the course and then manage the wear through the drive. I supposed we could get rid of the FIA and let it be a free for all and only one or two teams would ever win and there would be more accidents, but is that the spirit of competition? Six winners in six races with everyone getting a legitimate shot at the podium as seen with Rosberg and Maldonado. Just look at the driver’s points race .. wow… this is fun! And talk about teams and team captains, Michael Schumacher. Believe it or not, I am not a Schumacher fan since he did that park job in front of my man Alonso. But you cannot talk about winning team chemistry and not speak to Schumacher and Ross Braun. Michael is back in the fold and after one season of being back in the seat, we are seeing consistent points and, in 2012 podiums, a win and a pole from Mercedes. Is this tires too? NOT, this is team chemistry with leaders in Schumacher and Braun. I am loving 2012. I would like to see more from Williams and Force India as I believe that is where some of the best team and driver action is going to be in this racing season. For the first time ever…my two cents. Thanks very much Jim for sharing your thoughts as well as for your compliments. It's very good to hear! I look forward to hearing more of your thoughts in the future! 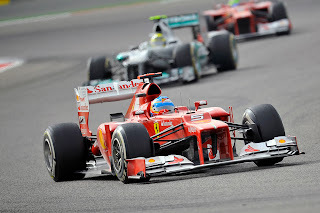 I agree with you - I'm loving this F1 season so far and the variation of winners and the unpredictability is fantastic. I'd take this over only a small number of drivers/teams having a chance to win and races where you know what's going to happen after a few laps any day!